Our brave squirrel #2 is now lost in the Mojave desert. Perhaps FS2 joined the army or needed to phone home via the Goldstone Deep space antenna network. The telemetry showed a deep decent at the end; indicating it was going to ground and the signal was probably lost because of mountains all around that area block signals to the ground squirrel locations. We were delayed on our expected launch time by an hour. Part of the delay was caused by circumstances beyond our control and some delay in set up that took longer than expected. We launched at 18:00 UTC and the first FSQ data from off the ground telemetry was at 18:01 UTC. The weather on Lucerne Dry lake was breezy at the time of launch and the balloon (on a 2nd attempt) took off rapidly to the east only rising slowly. The payload bounced a few times on the lake bed before it was finally able to lift off the ground. After the first FSQ data was sent, FS2 went into WSPR transmission for 4 minutes and then the sent the next FSQ message at 18:07. This telemetry showed the balloon right above Hwy 247 which runs North-South next to the lake bed. The balloon then took a sharp 90-degree right turn to the south, along the highway, and lazily ascended and looped around the launch site for the next hour. The breezy wind conditions were only at ground level. We were able to maintain visual contact with the balloon for this first hour, as it floated around us, which was quite a surprise! 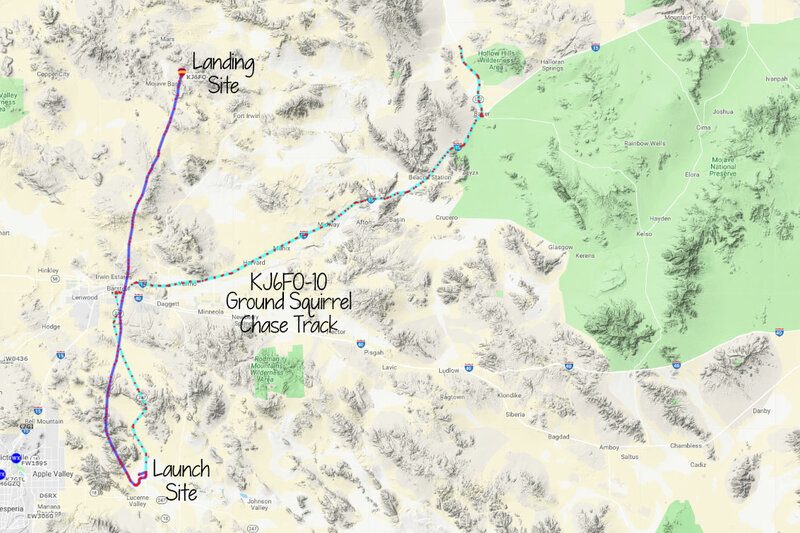 The flight predictions had indicated a similar initial path but then predicted the balloon proceeding to the east and along Hwy I-40. However, our mischievous squirrel had other ideas and went north! FS2 finally caught some wind and accelerated to Barstow ,CA. FS2 did not veer far off this course for the rest of the flight. Unfortunately, this took the balloon into Fort Irwin which is a 1,000 sq mile desert Army training base used for desert warfare training. This area is also the home of the Goldstone Deep space network antenna complex. All of this area is off limits to a drop in visit, so we were not able to follow the balloon into the area. With some hopes the balloon would continue north beyond the base or turn east, I drove out to Baker, CA and north on Hwy Ca-127 towards Death Valley. Because of the huge size of Fort Irwin and lack of northerly roads this was the only path around the base. During my drive east on Hwy i-15 to Baker, our ground squirrel team all noticed a sudden decline in altitude and we expected this was the end of our mission. I prepared to turn back to Barstow which was the closest off ramp to Fort Irwin. However, our squirrel was just playing with us. As quickly as FS2 had descended, it rose again and continued its way for another 60 minutes until the final dive started and contact was lost shortly after at 23:17 UTC. Why the sudden decline in altitude and rise? The balloon clearly still had lift because almost regained all of the lost altitude. The balloon was probably caught up in a down draft that almost ended the mission early. Some clouds were observed from afar so it is possible the dive was weather related. 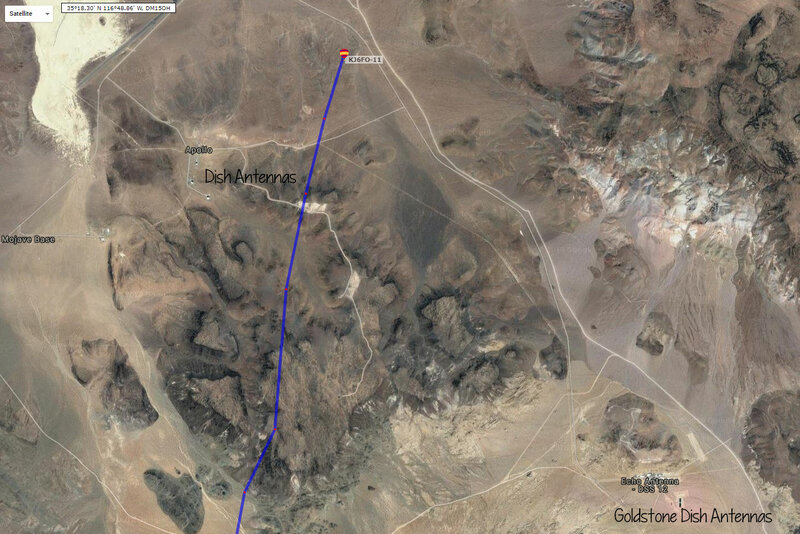 Fs2 appears to have landed very close to the Goldstone Deep space complex network. FS2 Landing area – Near Goldstone. A review of our goals. Have fun! – We had a lot of fun! Learn stuff & Educate. – We learned where we need to do further work. We learned that our telemetry worked very well. A lot was learned about the construction of the balloon and its performance. I will work on documenting the details one I have had time to wrap up. I look forward to share these results with other interested HAB teams. Track/Chase the Balloon with GPS tracking. The GPS via FSQ telemetry worked very well and could be heard for 100+ miles. FSQ is a very good mode for HF telemetry. The balloon could be heard from my home QTH when it was near peak altitude a distance of 62 miles, over some tall mountains of the LA basin. The balloon was easily trackable by the ground squirrels (Mobile stations) out to a distance of 40 mi and probably even further if we had the chance to be farther away. Signals remained at S5 over better until suddenly lost, maybe due to a hard landing or behind a number of mountain ranges. The WSPR transmissions were only heard by 7 stations, all in the eastern half of the US. I expected better performance on WSPR. Perhaps the bands were dead? Exceed the altitude of the FS1 flight of 13,500 meters. This was a solid fail. Windy weather at launch made it difficult to assess the amount of helium gas needed for lift of the balloon by suspending the counterweight. As the wind pulled on the balloon, it acted like it had lift, but on the first attempt the balloon did not get off the ground and just blew down range. A quick chase ensued, and the balloon was recovered. We added a second balloon and launched again. The balloon still had some difficulty getting off the ground but once it did it was able to gain altitude. However, the balloon only topped out at 4,314 meters (14,153 ft), far below our goal. The latex balloons should have had plenty of lifting ability, it appears we were too cautious in filling them and did not have enough helium gas in them. This failure is a sign we need to find a better way to measure lift and the amount of gas we inflate the balloon with. Payload and launch costs under $50.00 per mission. I will do a check up on this in a separate post. I think we right at the $50 goal. Stay tuned. I will post more detailed info on the flight soon, including some maps and a Google Earth KML file. The Mojave Desert will start getting very hot now until the fall, so a lunch of the next mission (Fs3) will be at least 3 months away. Squirrel Engineering will focus on some other projects until then. Thank you for following the FS2 project! Stay tuned!